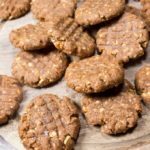 How about a grain free sweet treat this Easter? These Keto hot cross buns are super soft and fluffy! 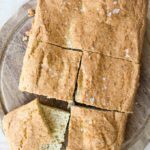 They are made with almond flour, which makes these gorgeous pillowy yeast rolls gluten free and Paleo, too. 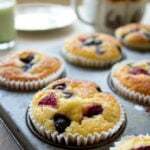 Perfect for breakfast or as an afternoon nibble. I have been dreaming of sweet yeast rolls recently. I used to devour the “milk buns” we had at home when I was little. Later, I developed an intense love for anything called brioche or challah. 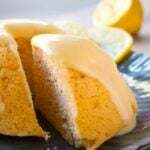 Over the years, I’ve posted a range of low carb and keto bread recipes, rolls and buns. But so far, I’ve never tried baking with yeast. 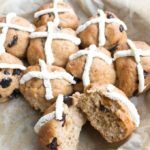 With Easter just around the corner, I decided to test my baking skills by creating a healthy version of the English Easter staple hot cross buns. And I’ve gotta say, these handsome guys don’t just look good. They taste great, too! The issue with yeast is that it needs to feed on sugar to be able to cause dough to rise. There’s plenty of sugar in wheat. But what if you want to bake grain free? Almond flour is low in carbs and sugar. Many Paleo recipes use honey or maple syrup to help yeast dough rise. In theory, there won’t be much sugar left once you put your buns in the oven. Nevertheless, I decided to opt for a more low carb solution and used inulin instead. Inulin is a prebiotic, soluble fibre found in many plants, for example chicory root. It is gently sweet and very beneficial for gut health. You can read all about inulin in this article. 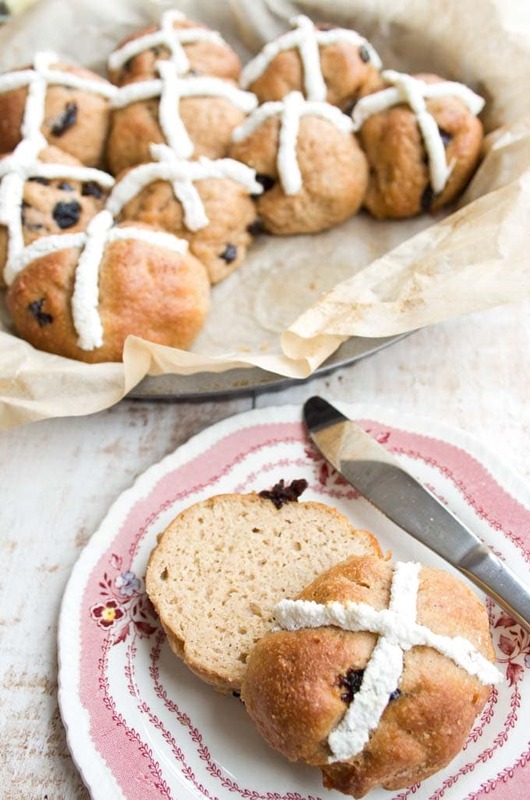 I’m pleased to say that inulin helped these hot cross buns rise like a dream. It’s not cheap, but I really like the taste (very natural – no aftertaste) and want to test it in other recipes soon. Gotta use up that pack! 1.) Proof the yeast by mixing it with warm water (ca 40 Celsius / 105 Fahrenheit) and inulin. Cover your bowl with a dish cloth and place it somewhere warm and not draughty. It should froth up and thicken. If it doesn’t, start again with a new batch. 2.) Crack 2 eggs and 2 egg whites into a bowl. Make sure they are ROOM TEMPERATURE! Add melted (WARM, not scalding hot) butter and your water/yeast mixture and blend until fluffy and frothy. 3.) 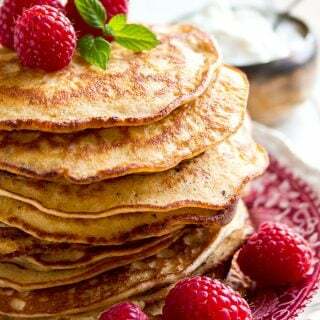 Mix all your dry ingredients in a separate bowl (almond flour, psyllium husk powder, whey protein, baking powder, cinnamon and grated orange zest, if using), then add them in 2 batches to the eggs, butter and yeast, together with the yoghurt. (Disclosure – I did not pre-mix my dry ingredients in the test run that I photographed here. 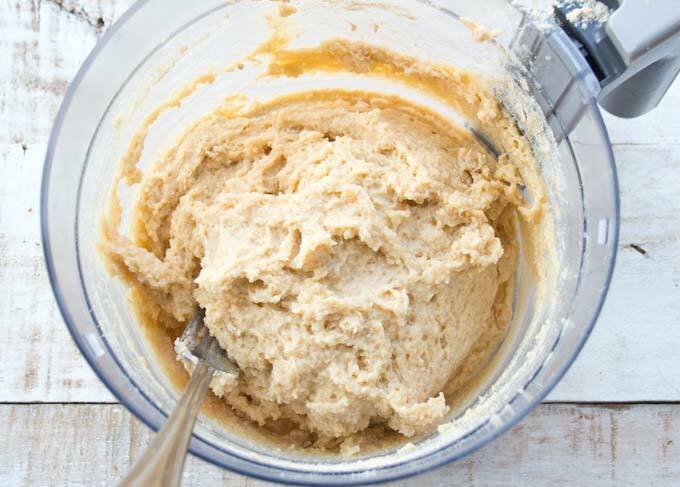 But you live and learn – the dough thickens very rapidly and by pre-mixing you ensure best results). 4.) 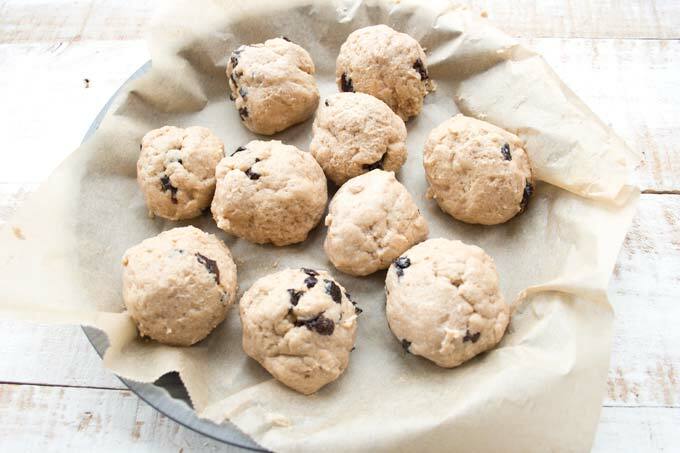 The almond flour and psyllium will absorb the liquid quickly and your dough will become quite firm. Now, stir in the diced prunes by hand. 5.) Lightly wet your hands (the dough is VERY sticky) and form 10 buns. 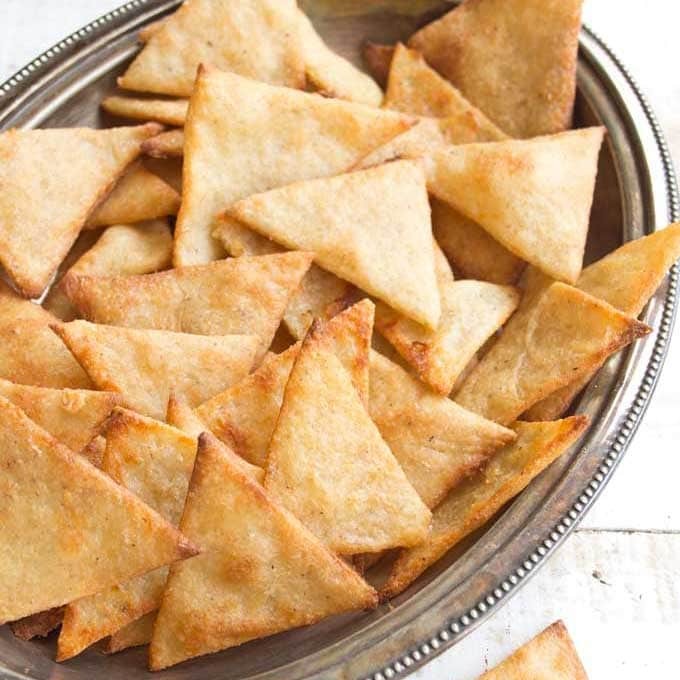 Place them in a baking tray lined with parchment paper. I used a pie/tart dish. Leave a little space around each roll as they will expand in size. Cover again with a kitchen towel and put back in your warm place for 50-60 minutes. 6.) Now let’s get onto those all-important crosses! I decided to use coconut flour as it’s so nice and white and mixed it with water and xanthan gum to form a paste. Fill into a small ziplock bag and snip off one corner. Pipe the mix over the buns. 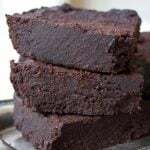 TIP: Don’t leave out the xanthan gum. It binds the water. I tried using only coconut flour and water first, but the mix separated when I tried piping it. Guar gum could be an alternative, though I have not tried it. 7.) Bake for about 25 minutes in total. At minute 15 (your buns should have started to look golden brown on top) cover loosely with aluminium foil to prevent the tops from burning. 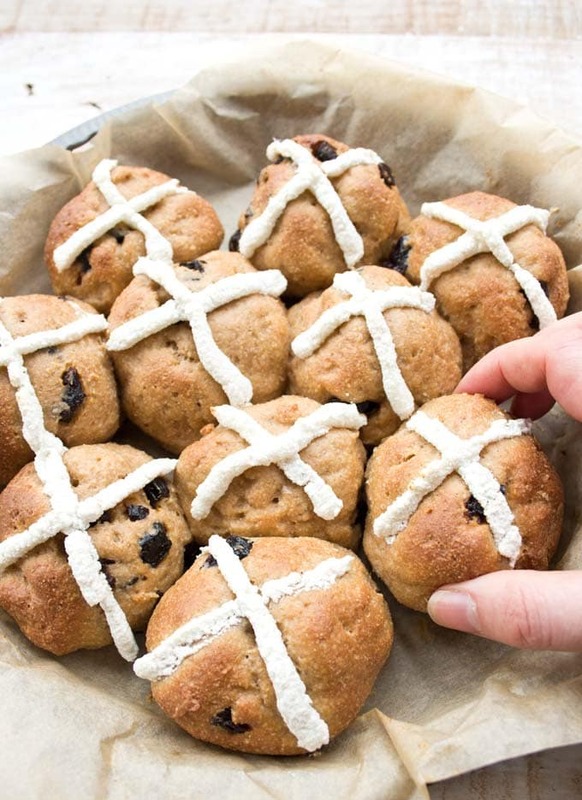 After you remove the hot cross buns from the oven, let them cool down a little to allow the texture to strengthen and improve. I can’t say this often enough – the correct temperature for the ingredients is key. The buns you see in the images are still slightly smaller than they should be because I was impatient and did not wait until my eggs were completely room temperature. I have since made Keto pull-apart bread rolls using the same basic recipe and they rose about 1/3 more. If you cannot get hold of inulin, you could use honey or maple syrup as a substitution. It’ll still be a low carb bun as the yeast will feed on (probably most of) the sugar. The cinnamon and orange zest added a lovely flavour to the buns. Crushed cardamom seeds would also work well here, a little lemon zest or even pumpkin / mixed spice. I don’t think the recipe needs additional sweetener – unless you opt to leave out the prunes. I chose prunes because they are lower in carbs than raisins or currants. 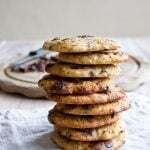 But as the total carb count is still very low, replacing the prunes with raisins would still keep these buns ketogenic, Cranberries could also be an option. A quick word about the nutrition: We normally deduct the fibre from the total carbs. 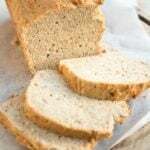 Due to the psyllium, this recipe contains as many grams of fibre as total carbs. In cases like this, I always check out the sugar content, which is 3 grams per portion here (as a reference – 4g of sugar is equivalent to 1 teaspoon). For those of you who cannot have / don’t like almond flour, I normally recommend to use half the amount of coconut flour in place of the almond flour. 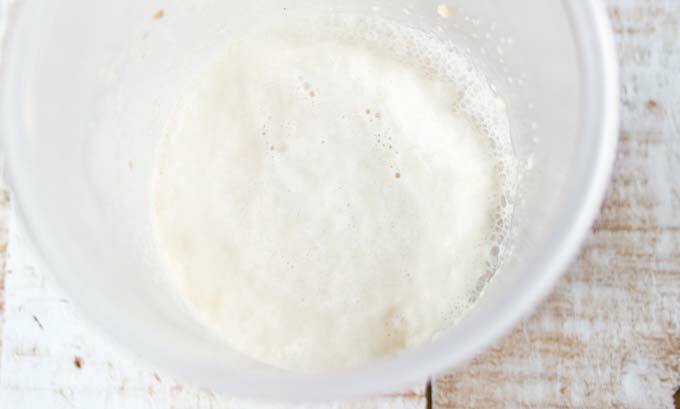 Coconut flour absorbs more liquid, that’s why you need less of it. I’ll be honest with you though. 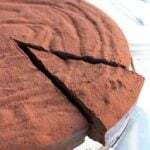 I haven’t tried this myself and as this recipe is a bit lengthy I don’t want anyone being disappointed. Please try at your own risk and let us know if it was a success. 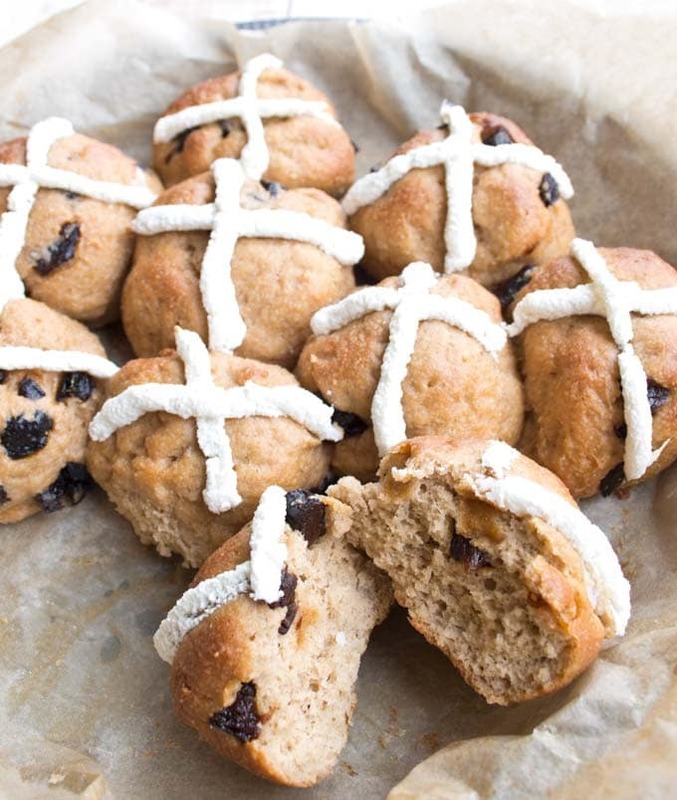 These hot cross buns taste great on their own or with lashings of butter. You can toast them and they freeze well. Store in an airtight container on the kitchen counter for up to 2 days or in the fridge for around 5 days. 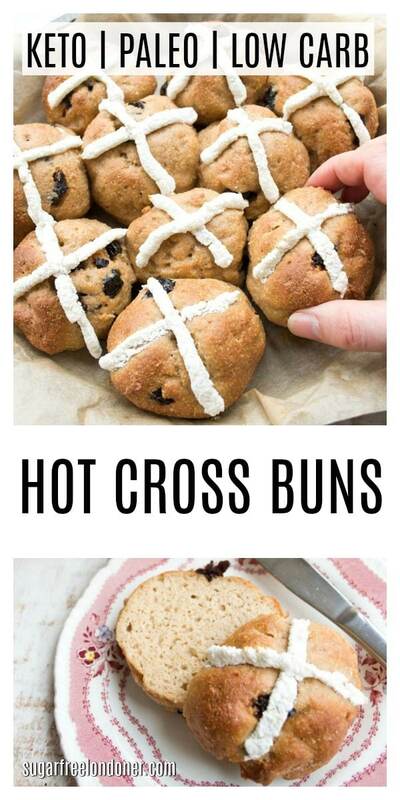 Tried these Keto hot cross buns? Give them a star rating below! 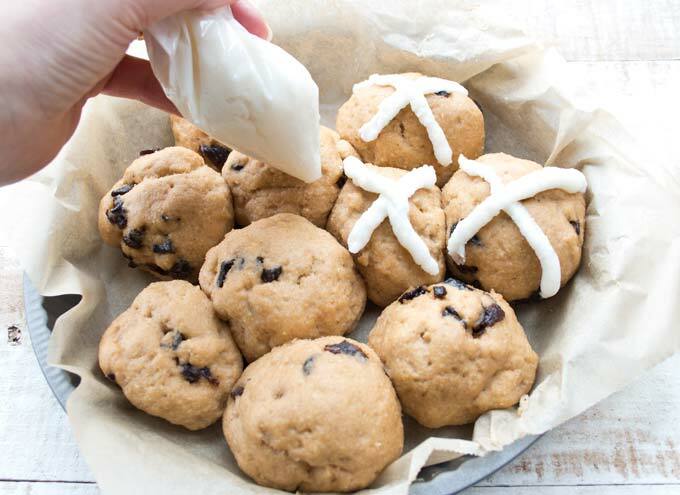 Enjoy these soft and pillowy Keto hot cross buns for Easter! These gorgeous, fragrant yeast rolls are gluten free, paleo and taste absolutely delicious - as always, not eggy at all! Stir the yeast and inulin into warm water (40 Celsius / 105 Fahrenheit). Cover with a kitchen towel and leave to proof in a warm place for 5-10 minutes. It should start to bubble and thicken. Combine the dry ingredients (almond flour, whey protein powder, psyllium husk, baking powder, cinnamon and orange zest, if using) in a bowl and set aside. 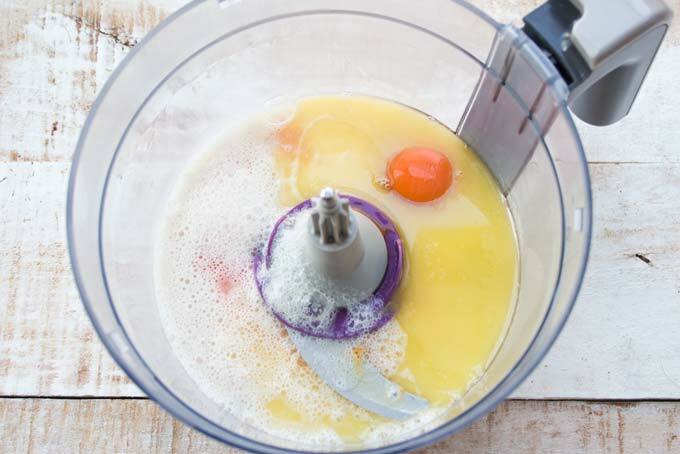 In a food processor or in a bowl using an electric mixer, whisk the ROOM TEMPERATURE eggs and egg whites, melted butter (make sure it's WARM and not HOT) and the proofed yeast mixture. Now ad the yoghurt and the first half of the flour mix. Blend until combined. Then add the second half of the flour mix. The dough will thicken quickly. Now stir in the diced prunes. Line a baking tray with parchment paper (I used a round pie dish). Wet your hands and form 10 dough balls. Place them in your dish, leaving space around each as the buns will rise. Cover again with a kitchen towel and leave in a warm space for 50-60 minutes until the buns have significantly increased in size. Towards the end of the 50-60 minutes, preheat the oven to 175 Celsius / 350 Fahrenheit. Now it's time to make the mixture for the crosses. 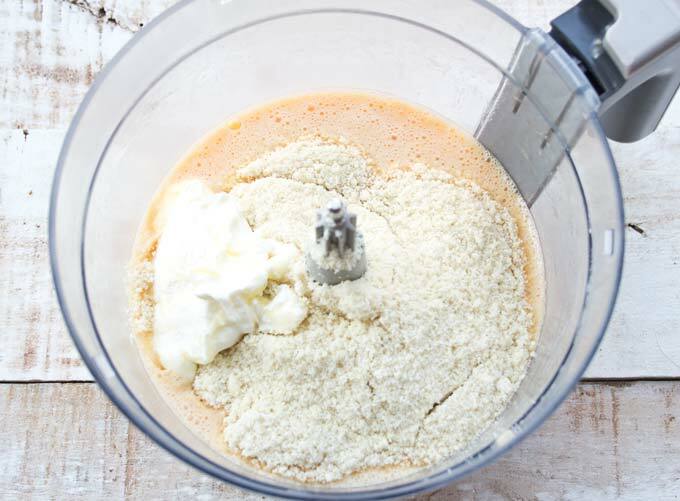 Mix the coconut flour, water and xanthan gum so you have a soft paste. Fill into a small ziplock bag, snip off one corner and pipe crosses over the buns. Bake 15 minutes or until the buns start to brown. Then cover loosely with aluminium foil and bake for another 7-10 minutes. Total baking time should be around 22-25 minutes. The yeast can die in an environment that's either too hot or too cold. That's why it's important to use WARM water, ROOM TEMPERATURE eggs and WARM melted butter. Don't kill the yeast and end up with hard, tiny rolls. Don't miss the step where you proof your yeast. It should bubble, thicken and froth. If it does not, start again with new yeast. I chose prunes for my buns because they are lower in carbs and sugar than raisins and currants. But by all means, you can use raisins, too! Hi Vicki, I’m so glad you like the recipe!! And thanks for letting us know about the coconut flour – how much did you add? Happy Easter! Can I substitute Flax seed for psyllium ? I think it would probably work, the two are pretty much interchangeable. I find that flax has a stronger taste than psyllium though, so the flavour would change. 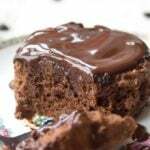 I am in the habit of using collagen peptides in my baking. Do you think this could replace the whey protein? This recipe looks good, but can you please confirm the net carb value, as the nutritional breakdown implies zero!? Hi Jane it’s all explained in the post. The psyllium is really high in fibre, that’s why the recipe is technically zero carbs. However, we have to take into consideration the sugar content, so you can see that as your “net carbs” as there are carbs in sugar. Hello, recipe looks great. I’ve got a query about the protein powder, I don’t have any. Is it crucial to the recipe? Hi Katherine, protein powder does help with the structure of the buns and makes it fluffier, that’s why I decided to use it. I think it’s worth while having in the house – I like to use it in granolas also, for an extra protein kick, such as this low carb granola. In its place I might use 3 tbsp almond flour plus 1 tsp xanthan gum (again, for structure) or maybe 2 tbsp almond flour and 1 tbsp flaxseed meal, but that would be an experiment. I want these buns to be a success for you, so if you decide to use a substitution, I have my fingers crossed.